From a practical standpoint, organizations need to manage their way through the transition to pervasive transparency, pacing their evolution with changing stakeholder expectations. This is where social media and social business are valuable as separate-yet-related competencies. Now let’s dive into how to develop each and use them together. I have written extensively about how social media and social business differ from each other because my work with commercial, government and nonprofit clients has consistently shown the importance of recognizing their differences. Currently most brands and firms lose value and increase risk by treating “social” as one thing. By appreciating each flavor, they will drive more value. 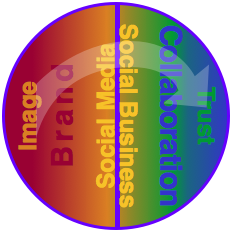 Social media and social business both use digital social (peer-to-peer) technologies, but their purposes are different. Social media practices are grounded in marketing and promotion and, because they also give individuals the chance to give their opinions, people usually prefer social media over any other kind of marketing and communications. Social business is a different animal that’s focused on helping people attain their highest priority outcomes of using products and services. It’s closer to what people used to call “customer service,” with the notable exception that it’s proactive and serves high-priority people whether they are “customers” or not. Both social media and social business are important, and they are even more valuable when used together. Before recommendations, let’s examine each one and what makes it tick. Social media is the past and present because it emerged first and popularized digital social tools on a mass scale. Its champions are marketing and communications practitioners, who are chiefly concerned with communicating, influencing, promoting and selling. Being communicators, they quickly recognized and embraced social technologies because digital social presented opportunities and threats to them. They have used digital social technologies according to their beliefs, occupation and practices, so social media has a marketing DNA. Even today, virtually all social media activity is primarily focused on using “content” to “engage,” and it treats interaction as secondary. All social media practitioners talk about “engagement” and “interaction,” but their activity reveals that they invest more in content than interaction. Social media’s focus on content is understandable because the economics of the entire marketing profession have been most powerful when it scaled, and content scales beautifully. Most business functions during the Industrial Economy created value through efficiency and economies of scale. However, mass communications have deadened people, and their ability to get attention is dropping precipitously. In addition, social media is comfortable to practitioners, organizations and customers because it feels familiar, in an industrial kind of way. Social business is the present and future. It differs from social media explicitly and implicitly. Its explicit difference is that it uses experiential social media to focus on interaction and collaboration while “content” takes the back seat. Therefore, its core activity is the polar opposite of social media marketing. 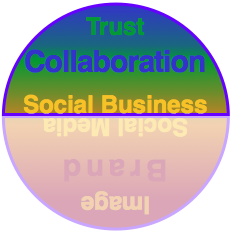 Social business practitioners relate to people by listening, suggesting, supporting and collaborating. Social business changes the economics of relationship itself because it lowers the cost of each stage of the relationship life cycle by an order of magnitude: discovering, inviting, building, maintaining and transitioning. Dive deeper in Social Networks and the Relationship Life Cycle. Implicitly, social business is transforming all human organizations because the economics of communicating, collaborating and working have changed. “Organization” itself refers to groups of people working together to fulfill a mission while interacting with people inside and outside the “organization.” When the cost of relationship falls by a factor of magnitude (ten), and the speed of relationship also increases significantly, organizations feel strain because a key construct of their foundation has transformed. This is happening right now, and the strain will keep increasing over the next 5-10 years. Industrial Economy organizations are founded on expensive analog communications and work processes that are breaking because they’re inefficient in the digital social age in which communication is virtually free. Most workers are at the beginning of the learning curve of interacting, trusting and collaborating in transparent digital environments, so their inexperience has created a temporary lag in business results. Social business as a practice focuses on accelerating adoption and breakthrough performance improvement. To complete the picture, we have to understand how organizations’ relationships with people are transforming, so we can fully appreciate the role of social business. In the last three centuries, people have traded personal attention and service for more product at lower price. The small-town merchant’s care and attention vanished in favor of huge, impersonal products and organizations with unparalleled selection and low prices. People voted with their pocketbooks for low product/price over personal service and product. But they didn’t like to be treated as segments, demographics or psychographics. Dive deeper in Digital Transformation’s Personal Issue. Say how much “they care” on websites and marketing collateral while sending you promotions for their products you already use? “Manage” customer service as a cost center, putting you on hold and not really listening when you have product issues? When you complain on Twitter or Facebook, they immediately ask you to “take it offline?” This is the past and present. Show how much they care by admitting it in public when they are wrong? Ask you detailed questions about why and how you are using their product? Are sincerely interested in how you are trying to use their product to get results? Recommend a competitor’s product if they think it will help you reach your goal better than their own product? This is the present and future. This organization-customer transformation will be unfolding over the next five-ten years. Smart organizations will be more proactive and lead the market. If you really think about it, I think you’ll see that this transformation will create new winners and losers because customers are rapidly changing expectations of how they will be treated. The first organizations that adopt #2 will set the bar for all others. Customers love them because they have shown that they love customers. They have trusted customers with the truth and with honesty. This is the face of business in the digital social age. Since social business practices use digital social technologies to listen/respond/relate to people, they are the main enabler to deepening relationships and driving sales. Business has changed to its core. It will increasingly be driven by truth and trust. Social media is the past and present, social business the present and future. One thing about business that is not changing is that businesses that serve their customers/stakeholders better will win. That increasingly means providing personal individualized experience. To manage through the transition, organizations need to anticipate changes in stakeholders’ expectations. Since most people are connected digitally now, expectations and markets move faster. Use social media to interact with people in a traditional marketing relationship while you use social business to practice “deep engagement” and collaboration. Here’s how to do it. In late 2013, most organizations and brands have social media operations underway. Obviously social media initiatives vary significantly across industries, organizations and cultures, but here is a general overview of the status of adoption and how social media will develop through 2020. Social media usually focuses on large audiences and popular platforms because practitioners want to project their brand and distribute content far and wide. People expect brands’ presences and to interact when they want. Social media is “interaction light,” and it meets customer expectations in a wide range of situations, so it favorably impacts customer experience. Social media is the bun when it comes to developing trusted relationships. Practitioners talk about authenticity and transparency, but most are more concerned with creating a positive image than about helping customers. For one example, the social media “best practice” for “helping” customers with complaints is to transition to email or phone because they want to minimize the chance of revealing customer anger and frustration in public. Social media in general struggles with “ROI” because it’s grounded in brand building. That said, there are growing case studies that show how organizations have seen “business results.” Overall, the main reason it is so popular and prevalent is that other marketing and promotional tactics are even less effective. If my conclusions drawn from raw analyses of thousands of digital interactions prove correct, and humans’ natural organizational state is collaborative, social media will gradually assume a niche role within a collaborative world. In some cases, you can evolve from social media to social business, but most organizations will develop the two socials separately and integrate them over time. See the Social Media Upgrade Use Case for detailed recommendations. Marketing drives social media in most businesses, so it should collaborate intensively with operations and customer service to map what the organization’s capabilities are for satisfying customers. You need to be very transparent with what you can do and what you can’t. Want to care. By admitting your pimples in public, you’ll allow people to love you. Really. Exceptionally few people can resist honesty. Don’t silo social media; rotate in team members from sales, operations, customer service, marketing and R&D/product development/engineering. I recommend a Social Business Competency Team to manage this. Regarding the “need” for marketing and promotion, remember that, in an ultra-efficient market built on cheap communications, there is little need for marketing because the network connects people with tools (products, services) based on what people are trying to do. See Anonymity, Marketing and Predicting the Future. In late 2013, social business as defined here is practiced at very few organizations, but every organization should be building the competency as quickly as feasible. Social business is the meat when it comes to developing trusted relationships. Most brands, businesses and organizations have yet to discover the power of relating, treating people personally, at scale, in public. They are still trying to “succeed” with social media. See Personal Individualized Experience to drill down on this. B2B and professional services firms’ DNA is developing relationships and educating prospects about complex, expensive products and services, so they have a natural propensity for social business; however, they are currently bamboozled by the social media red herring that holds that “social” is about promoting. They are trying to use B2C social media practices, which fit poorly for the relationship building necessary to encourage high-cost, high-risk deals. Organizations increasingly talk about “developing trust,” but it won’t work until they eradicate the brand-first mantra. Organizations that are consistently willing have open discussions with customers using their products will earn trust and preference. This is absolute: no truth, no trust, no preference. This is a profound shift; it requires deep cultural transformation in most organizations. 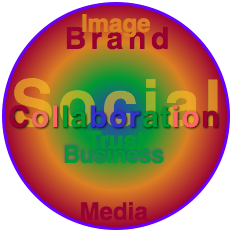 Social business focuses on helping customers attain the outcome of using products/services. The organization moves from being self/product focused to being customer/outcome focused. Brands that put customers first will be insanely admired and even loved, so they will dominate their markets. To repeat, this means focusing on the person’s use of the product, not only the product and its features. Most of the “us and them” attitudes and processes will fade away in favor of stakeholders and employees collaborating, usually in open forums. You can drill down on this transformation in The Social Channel. Organizations that retain the “us and them” mentality will disappear because they will not have collaborative relationships with the customers/users of their products and services. Again, think of yourself as customer: do you prefer to be sold to or collaborated with? Providers (organizations) and users (people, organizations) will innovate constantly and profoundly together. Few organizations will survive that don’t have seamless collaboration with customers and other stakeholders. Software-powered tooling everywhere in products’ design and production processes will enable profitable mass customization for most product categories, with users’ input. Longer term, the maker movement will disrupt all Industrial Economy product processes by changing customer expectations of what “a product” is. See Knowledge Economy Products and the Future of Manufacturing. As discussed above, social media is a significant plank in most organizations’ marketing programs, and it’s a favorable part of the brand’s image that adds marketing value but usually few measurable business results. Moreover, customers, employees and other stakeholders expect every organization to be accessible on popular platforms like Facebook, Twitter, LinkedIn, YouTube and others. Many brands outsource social media operations to digital agencies—as they have long outsourced other marketing operations. Since social media adds marketing value and is expected by all stakeholders, organizations and brands should continue to operate it while improving it. At the same time they aggressively develop social business competency. I’ll summarize some key points from the Social Media Upgrade Use Case, which includes its own guidance for building social media teams. As quickly as feasible, transition social media operations in-house because building core competency is critical. Once you understand that “social” is increasingly about relationship, outsourcing to agencies is a much more tenuous proposition. 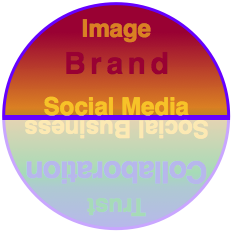 You probably have numerous brands/businesses with their own social media operations. Use some of the ideas in the Herd the Cats Use Case to create a process to share and synthesize good practices. Pick a business or brand to debut social business. There are several options: 1) you can commission an enterprise digital ecosystem audit to identify businesses/brands with stakeholders (often customers) that are predisposed to having digital social interactions. 2) You can query general managers, CSOs (sales) or CMOs about their stakeholders’ online collaboration habits. 3) You can select a business/brand that’s failed with social media and wants to reboot. Another indicator for social business candidates is how open executives or their teams are, not in words but actions (If they’re not blogging and having substantial online interactions, they probably don’t really get it). 4) Pick a business with a track record for disruptive innovation. However you select it, that business conducts a social business strategy and pursues several pilots. The Chief Digital Officer or other executive sponsors a Social Business Competency Team to orchestrate adoption across businesses and brands. The SBCT will be necessary to optimize adoption, and the earlier you seed it the better. It can start with a part-time person. In summary, you want to evolve social media to become more interaction-focused while retaining its marketing and PR benefits in the short/medium-term while you are spinning up the social business teams. Although this varies widely by industry/business and culture, in most cases, you’ll benefit from keeping social media and social business as separate teams in the next 1-3 years. Think of social media as “marketing+interaction” and social business as “deep engagement” that does not market. Social media will remain relevant longer to some brands/products than others, but all will benefit from developing deep engagement capability. Once the social business team has its sea legs, there will be numerous opportunities for them to collaborate. Of course, in the medium/long-term they integrate in concert with stakeholder expectations. In 5-10 years, when your company has built a dense, collaborative web of online relationships that put the stakeholders first, you will no longer need to “market” or “sell” to them. The right candidates will present as employees or contractors, the market will put the highest value customers in touch with your products that offer them the highest impact. Right, now, this is a huge leap of faith that few firms and marketers are willing to make, so respect that and keep the social teams separate but related. In summary, I predict that the importance of social media marketing will shrink while the need for social business will displace it. The speed at it happens will vary by culture, geography, industry and several other factors. Organizations that lag in developing social business “relating” skills put themselves at significant risk. Assuming your organization is a top three competitor in many of its categories, imagine one of your arch rivals developing social business competency. Imagine your competitor is loved while you are tolerated. Imagine you are HP’s PC business competing against Apple. There will be Apples in every business. Social business demands higher order social skills than social media. It’s a full contact activity where social media is more superficial. Social business teams are focused on customer outcomes of using products, so they get far deeper into customers’ lives. Expect a relatively long learning curve. Social business is much harder to outsource than social media, so don’t assume you can “spin up quickly” by hiring it out. In 2013, exceptionally few businesses and brands put the customer/employee/other stakeholder first because the Industrial Economy mantra was “business first.” This is understandable, but it changes in the digital social era because you can now have authentic digital interactions with a minority of customers. Since these interactions are infinitely reusable, they function as “marketing.” Before, if your company wows me, I might tell a handful of friends and family. When you wow me in a digital social venue in an interaction that’s infinitely discoverable (digital) and lives forever, hundreds or thousands of people see, automatically. But this only works when organizations truly put people first. Now organizations say they do, but they don’t. There’s no halfway. Reread the two points under “Organization-Customer Transformation” above. The first businesses and brands that live #2 consistently will rapidly rise into a class by themselves. That can be you. You can be the Apple of your category.